Spring in Northern California usually brings wonderful wildflower displays. I will be traveling for the next few days around Northern California doing a photo shoot for the Trust for Public Land in some oak woodland areas which should have some good wildlfowers. For those of you planning California wildflower photo shoots, you should check out Carol Leigh's Wildflower Hotsheet located at Cal Photo . People write in from all over the state to report wildflower sightings. 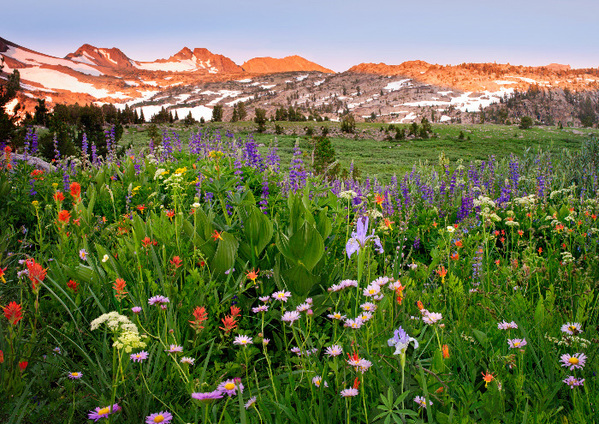 My favorite displays are later in the summer in the high Sierra - the flowers in the high country bloom in July. One of the best areas is the Lake Winnemucca Trail from Carson Pass. It is accessible and has a great variety of wildflowers. The shot below is from this area. Those are wonderful photos that you show here on this blog. Really stunning. I've been enjoying your new blog; welcome to the blogging world. This is a magnificent image. Nothing like this can be found here on the middle peninsula of Virginia. Although we do have our own beauty, it is always a pleasure to enjoy that of other parts of our country.